(Scroll down for video) A father used his two kids to help him rob banks. The father has raised his two kids by himself after their mother passed away. The father, his son and his daughter were arrested after they were caught robbing a bank. Now police believe that they are responsible for a string of seven bank robberies across two state. 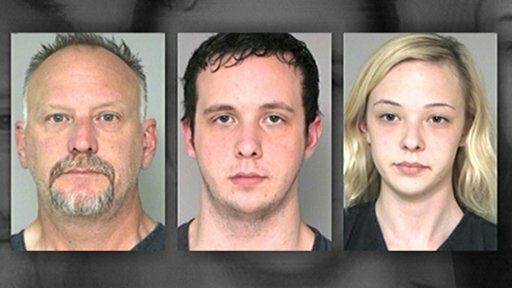 Ronald Scott Catt, 50, his 20-year-old son Hayden and his daughter, 18-year-old Abby, were arrested last week and charged with robbing a credit union in Texas. The Crime stoppers organization has posted signs with the picture of the wanted robbers, and they promised a reward of $25,000 for a tip leading to the arrest of the bank robber. The tip led police to a local Home Depot where a security camera showed the family buying the disguise used in the robbery. The family recently moved to the area from Oregon. Deputies are looking into the family’s involvement in other robberies. During the robbery in Texas, two men who appear to be Catt and Hayden, entered the bank wearing costumes armed with guns before leaving with cash by jumping into a getaway car driven by Abby. The father and son were held in County Jail on $140,000 bond. Abby’s bond was set at $100,000. Unfortunately your browser does not support IFrames.